Guatemala surpassed all of my expectations. It was warm and friendly, outstandingly beautiful and rich in culture. 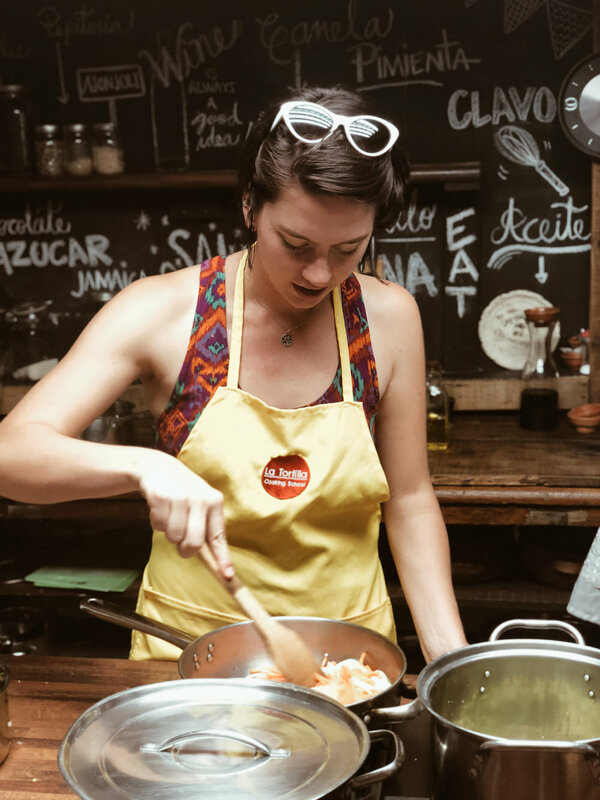 One cultural experience we got to participate in was a cooking class through La Tortilla Cooking School. 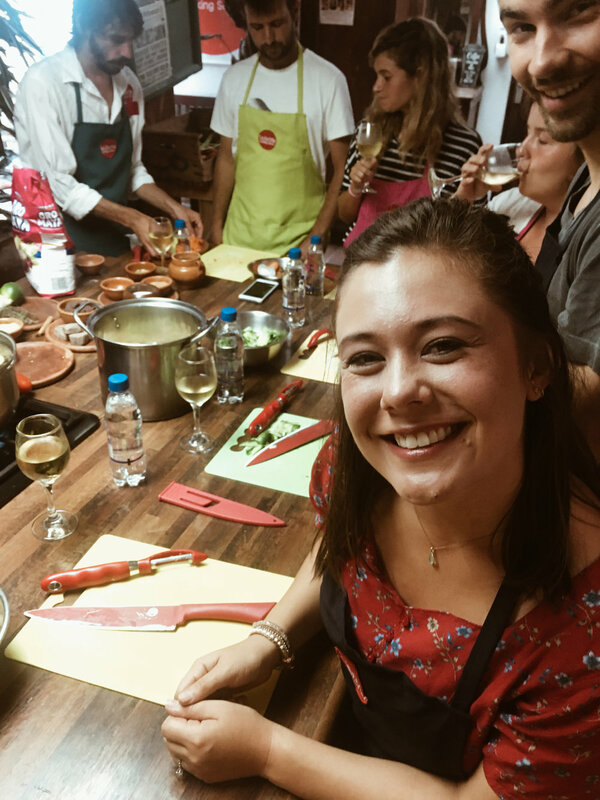 What made our experience at La Tortilla Cooking school extra special was the group we shared the class with. 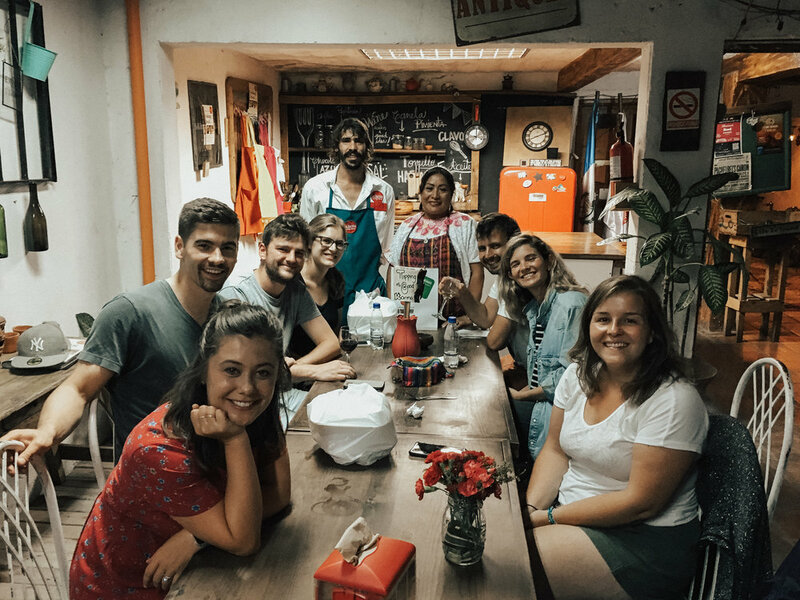 We met a couple from Belgium, a couple from Israel, a girl traveling from Canada and our translator who was from Argentina. Together we made six traditional dishes, drank lots of wine, and ate our meal family style on a big farmhouse table. Before we realized, La Tortilla was closing for the night but we were still not finished sharing stories and asking questions. Our translator told us about a brewery that we should go to (unbeknownst to us that it happened to be connected to the hostel he was staying at). Not long after arriving to the brewery our translator appeared and we ended up hanging out late into the night singing, laughing and drinking beer. During the class we learned how to cook Atol Blanco, Beet Salad, Guatemalan Rice, Pepìan, Rellenitos, and Tortillas. Atol Blanco is a thick, hot drink made from corn flour and water for the base. Additional ingredients may be added to make the drink sweet or salty. Beet Salad is pretty similar to the beet salad we would find here at home but with a Guatemalan twist using lime, onions and thyme to flavor it. Guatemalan Rice is made with carrots and onions but really you can add any other vegetables that you would like! 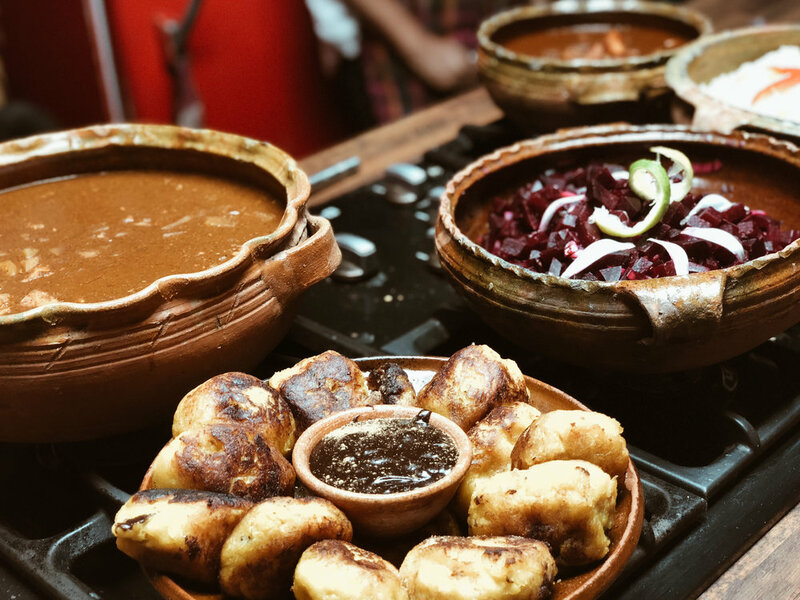 Pepìan is a traditional Guatemalan dish that is similar to stew. It is very time consuming if you choose to make the whole dish from scratch. Because of the time it takes to make this meal it is typically served on special occasions. Rellenitos is a dessert made from smashed plantains filled with chocolate, refried beans and cinnamon. 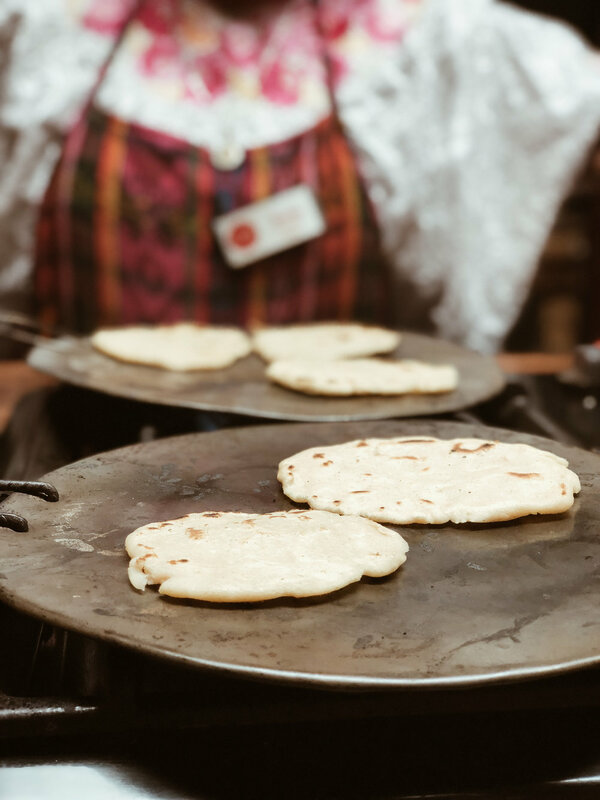 In traditional Guatemalan culture, being able to make corn tortillas is a necessary skill amongst Guatemalan women in order to be married. We got to try our hand and make some ourselves. It is harder than it looks, but also incredibly fun and rewarding to make when they are just right. La Tortilla sent us the recipes of all the dishes we made and I cannot wait to share them with you here! Cook the corn flour with water for 30 minutes stirring constantly. For the sweet version add the cinnamon stick to the water. For the salty version add the bay leaf. When the mixture has a thicker consistency and is really smooth without any lumps the Atol Blanco is ready. Depending on which version you prefer add the other ingredients to your taste. Trim off the ends of the beets and then cut them into quarters. Leave the skin on to keep the flavor and the color. Boil the beets with plenty of water until soft (approx. 20 min). Take them out of the water and let them cool. When they are cool enough to handle, remove the skin and cut into smaller cubes. Dice and add the onions, lime juice, thyme and salt to your taste. Serve the salad as a cold side dish. You can use any kind of vegetables you like. Peel the vegetables and cut them into small strips. Fry the vegetables in oil stirring them until the onions are crystalized then add the rice and keep stirring for 5 minutes more. Add enough to cover the contents of the pot and cook thoroughly until done (approx. 20 min). Serve the rice as a side dish. Using a comal or a flat frying pan and roast the tomatoes without oil on a high flame until the skin is a lose and a little black and the tomatoes are soft. Once roasted place the tomatoes in a bowl with 1 cup of water. Peel the güisquil and potatoes and cut them in cubes. Boil the vegetables with approximately 1 liter of water. Cut the chicken into a few big pieces. When the vegetables have cooked for approximately 5 minutes, add the chicken including the bones. Add a little bit of cilantro and a tablespoon of salt. pumpkin seeds, but make sure you put a cover on the pan when roasting the seeds. They have a tendency of jumping up when heated. Finally roast the allspice, cloves, cinnamon until the cloves get grey. Add all of this to the bowl of water. Put all of the roasted ingredients with the liquid in the blender. Blend until it is a smooth liquid and add to the stockpot with the chicken and stir until incorporated. Continue cooking without stirring it. Blend the corn flour with a little bit of water and add it to the sauce as a thickener. When all the vegetables and the chicken are cooked thoroughly your Pepían is ready. Usually this dish is served with Guatemalan rice. Cut of the ends of the plantain and discard. Cut the rest into 4 parts leaving the skin on. Wash the plantains and cook in a pot of water together with the cinnamon and sugar for about 10 minutes. When cooked, drain the water and save it. This water it is really healthy as it has a lot of potassium and can be drunk. Peel the plantains and mash them into a smooth paste without any lumps. Let cool. In a pan, cook the chocolate with 1⁄4 cup of water until completely melted. Add the black refried beans and mix well until they form a paste. Heat sufficient oil in a large frying pan. Take a little bit of plantain paste and form a little bowl. Add one teaspoon of the chocolate/bean mixture and close the bowl so it forms an egg shaped ball with the chocolate/bean mixture inside. Make sure there are no holes or gaps so the filling cannot leak out. Fry the stuffed plantains until they have a light golden brown color. You can serve them plain or with sugar. Mix the corn flour with water and knead until it becomes a smooth, thick dough, which always remains a little sticky. Put a little water on your hands and roll into a ball, clapping your hands to create the flat tortilla shape. Depending on your tortilla-making-skills and taste you can make big ones or smaller. Use a comal or a flat frying pan fry the tortillas without any oil on a medium low flame. Flip them from time to time. The tortillas are ready when they have little brown spots on them. This will normally take a few minutes.